Alisa Hansen posted some of her top social media lessons on the Great Finds blog. Find them here. Maybe not your first go-to site for SXSW coverage, you can alwasy count on the New York Times for an interested article or two about the event. Here is their look at how the Internet is changing the way artists use SXSW, and here is their recap of the entire festival. An excellent slide-show can also be found here. The LA Times summarized the many discussions and comments from indie labels on their plans for survival in this article. Thanks to @newandused for the heads-up! NPR, KEXP and WOXY were broadcasting & podcasting interviews, entire shows, and more. Follow the links for photos, videso, live sets and more from Peter Bjorn & John, The Decemberists, The Pains of Being Pure at Heart, BLK JKS and more! 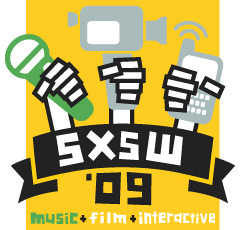 As before, those are some of our favorite articles and recaps from SXSW 2009–what about yours? Please share via Twitter or by leaving a comment below. Thanks for the kind words and the mention of my SXSWi ’09 sketchnotes! Hey thanks for the links to my SXSW posts! Hope you can make it next year! To both Mack and Mike–thank you for helping those of us who were #notatsxsw take advantage of the panels and share in the information, even if it was vicarious!